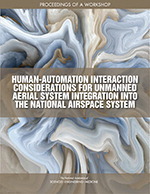 This publication from the Board on Human-Systems Integration and the Aeronautics and Space Engineering Board summarizes a workshop held in January 2018 to advance the understanding of the human factors/human-systems integration issues associated with the full integration of Unmanned Aerial Systems into the National Airspace System. This 2-day workshop aimed at advancing the understanding of the human factors/human systems integration issues associated with the full integration of Unmanned Aerial Systems (UAS) into the National Airspace System (NAS) was held on January 10-11, 2018. 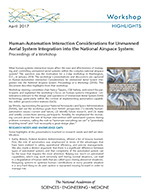 The workshop focused on human interaction considerations relevant to the design and operations of Unmanned Aerial Systems (UAS) technology, particularly within the context of implementing automation capabilities within ground control stations (GCS). The workshop will highlight existing human factors and human-systems integration research while identifying opportunities to address gaps and opportunities in research, application, and implementation. The committee did an excellent job of planning and participating in the event with each member moderating a session and in some cases being a panelist as well. There were over 75 attendees from government, industry, and academic institutions. The sponsor, NASA, was very excited about the meeting and hopes to hold a similar function in a year. After the workshop, proceedings of a workshop of the presentations and discussions at the workshop will be prepared by a designated rapporteur and published following the National Academies' policies and procedures for such publications, including the standard review procedures. The Federal Aviation Administration (FAA) is currently undertaking a broad program known as Next Generation Air Transportation System to develop, introduce, and certify new technologies into the National Airspace System. 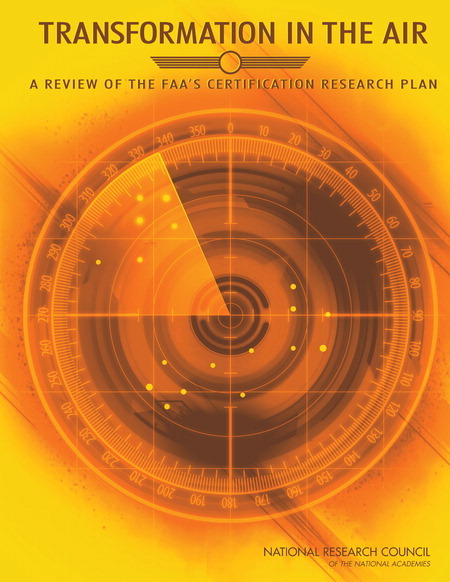 This report assesses the FAA's plan for research on methods and procedures to improve both confidence in and the timeliness of certification of new technologies for their introduction into the National Airspace System. The report also makes recommendations to include both ground and air elements and document the plan's relationship to the other activities and procedures required for certification and implementation into the National Airspace System. 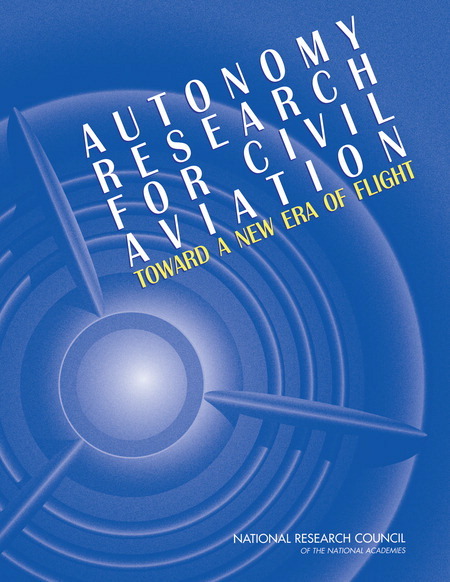 The development and application of increasingly autonomous (IA) systems for civil aviation is proceeding at an accelerating pace, driven by the expectation that such systems will return significant benefits in terms of safety, reliability, efficiency, affordability, and/or previously unattainable mission capabilities. This report identifies key barriers and suggests major elements of a national research agenda to address those barriers and help realize the benefits that IA systems can make to crewed aircraft, unmanned aircraft systems, and ground-based elements of the national airspace system. This report develops a set of integrated and comprehensive technical goals and objectives of importance to the civil aeronautics community and the nation. 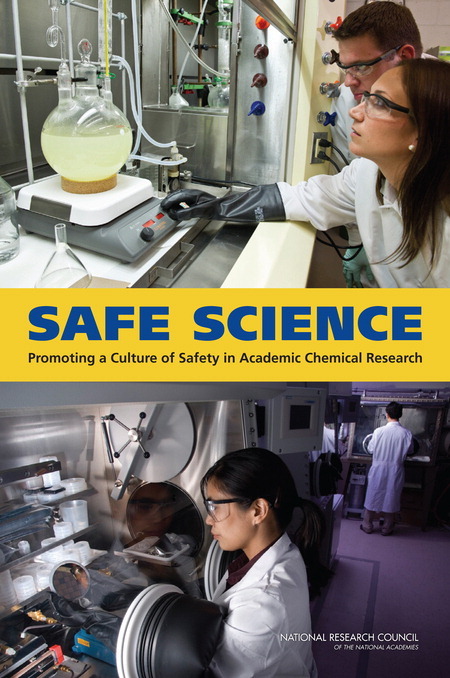 This report takes on this challenge; it examines the culture of safety in research institutions and makes recommendations for university leadership, laboratory researchers, and environmental health and safety professionals to support safety as a core value of their institutions. The report discusses ways to fulfill that commitment through prioritizing funding for safety equipment and training, as well as making safety an ongoing operational priority. An ad hoc steering committee will plan and conduct a 2-day workshop aimed at advancing the understanding of the human factors/human systems integration issues associated with the full integration of Unmanned Aerial Systems (UAS) into the National Airspace System (NAS). The focus will be on human interaction considerations relevant to the design and operations of Unmanned Aerial Systems (UAS) technology, particularly within the context of implementing automation capabilities within ground control stations (GCS). The workshop will highlight existing human factors and human-systems integration research while identifying opportunities to address gaps and opportunities in research, application, and implementation. The committee will define the specific topics to be addressed, develop the agenda, and select and invite speakers and other participants. After the workshop, proceedings of a workshop of the presentations and discussions at the workshop will be prepared by a designated rapporteur and published following the National Academies’ policies and procedures for such publications, including the standard review procedures.